Love your Colorado hardwood floors? Chances are if there are children and pets in your life, your hardwood floors may be an occasional thorn in your side. What do you do if your child spills juice … and you don’t notice it for over an hour? Or your pet has an accident … and you don’t notice it until the next day? Yes, if you have hardwood floors, you understand the way to keep them looking their best is to catch spills and accidents as quickly as possible. But if you leave any kind of fluids on the floor for any length of time, it can soak down into the wood and cause a problem. Although hardwood floors often come with some water resistance built in, hardwood floors are rarely infallible if liquid stands for a period of time. 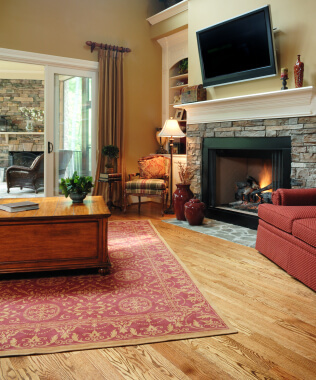 Therefore the best way to keep your hardwoods looking their best is to clean up all messes as soon as they happen. Even with prompt removal, some fluids, such as wine and dye, can leave a mark almost from the moment it touches the floor. Even in this case, by removing as much as you can quickly, you’ll prevent the liquid from soaking into the wood. If the liquid penetrates the wood, it becomes a bigger problem. In some cases you may not be able to identify the stain and what caused it. In some cases each stain produced needs a different remedy. Which means you should keep on hand a variety of cleaning products available to be on hand for any type of mess. Starting with a soft rag dampened with water is the best place to start, as water will remove everything from ink, to candy, juice, even blood. If you still see the stain after removing it with water, step up your game and use white vinegar instead. White vinegar can help you remove stubborn stains, such as a wine spill or darker fruit juices. Ammonia will remove stubborn stains like iodine, while chlorine is effective in removing more stubborn dyes. However, never use ammonia and chlorine together, as they will create toxic fumes. In many cases hardwoods will quickly react to water and other fluids by turning gray. Bleaching the wood with a solution of oxalic crystals and water will remove the gray color. To perform this process, you will need to sand the finish off of the stained area with a palm sander. Bleach the affected area. Then restain the exposed flooring before you recoat it with a clear finish. With extensive staining, it may be time to bleach and refinish the entire floor.